We understand how busy you are — you can never get to “inbox zero”, you’re traveling to recruiting events all over the country, and your family is wondering when you’ll be home for dinner. You’re not alone. Modern people overestimate how many free hours we have in a week, according to a New York Times article, written by a mother who recently spent a full year logging her activities each hour of each day. Aside from working 40 hours a week and sleeping 7 hours a night, the author realized she had 78 hours to do other things. That’s 3.25 days every week. At SportsRecruits, we work with hundreds of club directors, recruiting coordinators, and coaches who work full-time AND run successful clubs. Full-time job and social life aside, club directors have to focus on a variety of responsibilities to maintain the success of their club — coaching, scheduling, and recruiting to name a few. 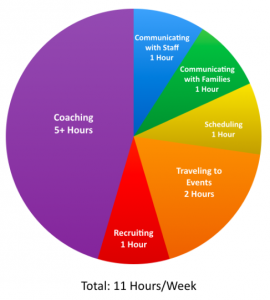 In recruiting, time is especially precious. The modern recruiting space doesn’t care if you’re too busy — it moves on, at a quicker pace than ever. We asked some of our most successful club directors on the SportsRecruits platform for insight on how they deal with realities of their busy world. Kurt is the Vice President of Business Development for a large, regional, commercial electrical contractor in the Pacific Northwest. He spends the majority of his time developing long-term business relationships, which means he’s consumed by in-person meetings and travel to connect with clients. When he’s not working, he’s running Mudville Pinnacle NW, a competitive baseball club based in Washington that Kurt founded in 1999. On average, Kurt spends 11 hours/week during the peak club baseball season helping Mudville players achieve their goal of reaching the collegiate ranks. The majority of Kurt’s time is spent on the field coaching,where he and his staff focus on player development and performance. “We prefer to focus more time on teaching the game and practicing”, says Kurt, who has over 30 years of coaching and sports management experience. He spends more than 5 hours a week coaching Mudville players on the field. Kurt spends time each week on SportsRecruits helping his players reach the next level. Within hours of receiving his SportsRecruits login credentials, Kurt was messaging coaches and tagging schools for his players to research and contact. “We like the ability to have one primary recruiting tool to help the players recognize opportunities through research and communication to a wide variety of programs,” says Kurt. When Kurt is on the road for work, or traveling to recruiting events with his Mudville teams, he can access his players’ research and communication with college programs at any time. Bruce is a full-time real estate broker and owner of a Keller Williams franchise, working 45-50 hours a week in Northern Virginia. Bruce is also the Head Varsity Lacrosse Coach at Briar Woods High School. Outside of the office, Bruce and the Cavalier Lacrosse staff are helping high school players prepare for lacrosse at the collegiate level. Since integrating with the SportsRecruits platform this past fall, CavLax’s 120 players have received more than 1400 profile and video views by collegiate programs. Prior to integrating with SportsRecruits, Bruce felt he wasn’t doing enough to help CavLax with the recruiting process. 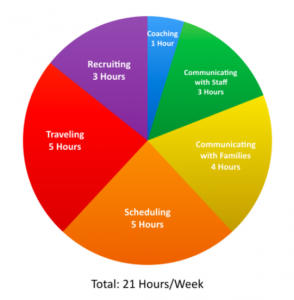 Since integrating, Bruce estimates that he spends about 3 hours per week on SportsRecruits checking in on the status of players, messaging coaches, and helping families navigate the process. Even though he spends 3 hours per week on the platform, he wishes he could dedicate more time to recruiting. “I spend too much time doing administrative tasks such as collecting past due balances, preparing rosters for tournaments and general bookkeeping chores. I wish I could spend more time on recruiting,” says Bruce. Now that CavLax has a streamlined system, Bruce is able to turn to his players to take ownership of their recruiting processes. Bruce consistently sends messages to college programs on SportsRecruits, which has played a huge part in CavLax’s success on the platform. In June & July alone, CavLax players have been viewed by college programs 285 times. The club has quickly established itself as a top lacrosse program in Northern Virginia because of his efforts and the club’s dedication to assisting families in the recruiting process. We’re not as busy as we make ourselves out to be. Next time you find yourself aimlessly scrolling through Facebook, or studying up on pop culture during your lunch break, login to SportsRecruits. Think about all of that undiscovered free time you have in a week, and dedicate a few minutes to your athletes. Integrating SportsRecruits in your daily, weekly, and monthly routine will have an impact on your players, their parents, and the success of your club. We all have free time to reply to that email or phone call, to spend 15 minutes on SportsRecruits every day, and to focus on the future of our student-athletes. We just have to use it wisely.